I wanted to let you all know that Alan Lander has stepped down as an elder and trustee of Kerith Community Church. Building K2, our youth and community building. Establishing our Konnections ministry to children with special needs, our CAP Debt Counselling Centre, our Foodbank and many other social justice ministries. Overseeing the transition from Ben Davies leading the church to me being senior pastor. Setting up and completing the Serenje project in Zambia, raising over £800,000 in the process. Alan was the prime driver behind this project getting started in the first place - without him it would never have happened. Establishing our new Sandhurst site. Doubling of the Sunday attendance of Kerith. Alan has also been the elder with specific responsibility for overseeing weddings in Kerith. In more recent years he has also been the elder and trustee responsible for overseeing safeguarding, an onerous, vital and often hidden role for us as a community. Our elders carry a huge level of responsibility, a responsibility which is relentless in its nature. Not surprisingly after 25 years Alan feels it is time to enjoy life without the constant pressure of that responsibility. He has therefore decided to step down as an elder and trustee with immediate affect. I've been leading Kerith for long enough now to know that when something like this happen there will be some people trying to work out what the "real" story is. The reality is this is the real story! Alan and I remain really good friends, he is totally supportive of the direction Kerith is taking and there hasn't been any sort of falling out with me or any of the rest of our team. Alan simply feels that this is the right time for him to step down, and that doing this will create space for him to focus on other things within Kerith, with his family and in his work life. We all in different ways owe Alan a huge debt of gratitude for his years of service, whether we're directly aware of his involvement or not. I'm personally incredibly grateful to Alan, and his wonderful wife Penny, who have been a huge support to both me and Catrina since I took over leading Kerith. They have been to me like Aaron and Hur who held up the hands of Moses in order to support and strengthen him in his leadership. A wonderful gift to any pastor. 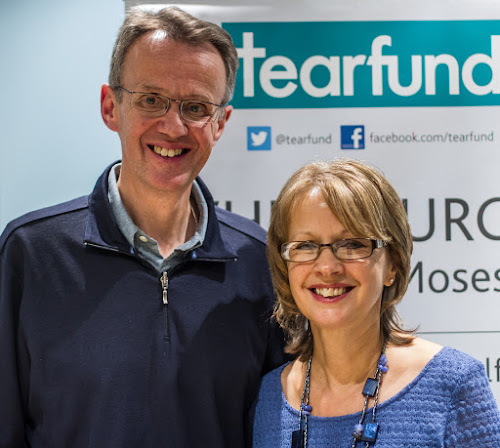 We're going to have the opportunity to thank Alan for all he's done, and to pray for Alan and his family in Sandhurst at 10am on the 21st February, and in Bracknell at the 9am and 11am on the 28th February. Please make one of those gatherings if you possibly can. Finally I know some people will want to know if we'll be looking to appoint a new elder or trustee in place of Alan. While we're always looking to strengthen both our eldership and trustee teams we're not going to rush into making any new appointments. The Bible is very clear that we shouldn't be hasty in the laying on of hands (1 Timothy 5:22) - I'm confident that the team we have now is strong enough to lead us in the next stage of our growth, at the right time we will look to add to both teams but we're not in any rush. I knew Alan and Penny Lander as far back into the 1970's. They have always been a great couple to get along with, and Alan has even helped me emotionally back in 1981 not long after setting off on my own to start a business, which remained ongoing for the next 35 years until retirement late last year. I wish Alan and his family all the best for the future, and with full blessings from God.